Chris Corning, of Silverthorne, executes a trick in midair during Dew Tour's snowboard slopestyle competition on Sunday, Dec. 16, at Breckenridge Ski Resort. 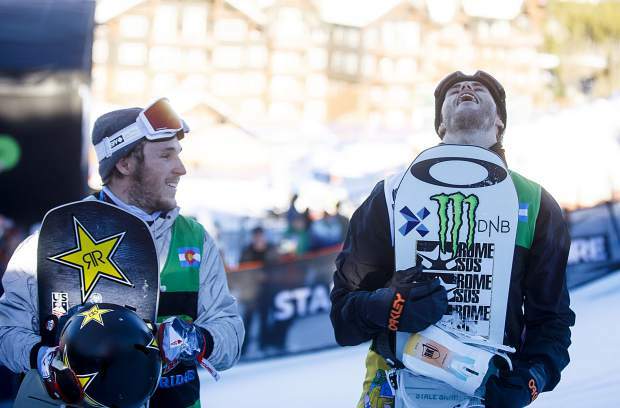 Stale Sandbech, of Norway, at right, reacts after winning Dew Tour's men's snowboard slopestyle competition on Sunday, Dec. 16, at Breckenridge Ski Resort. Chris Corning of Silverthorne, at left, placed second for the second consecutive year. Stale Sandbech, of Norway, executes a trick on the rail during Dew Tour's snowboard slopestyle competition on Sunday, Dec. 16, at Breckenridge Ski Resort. 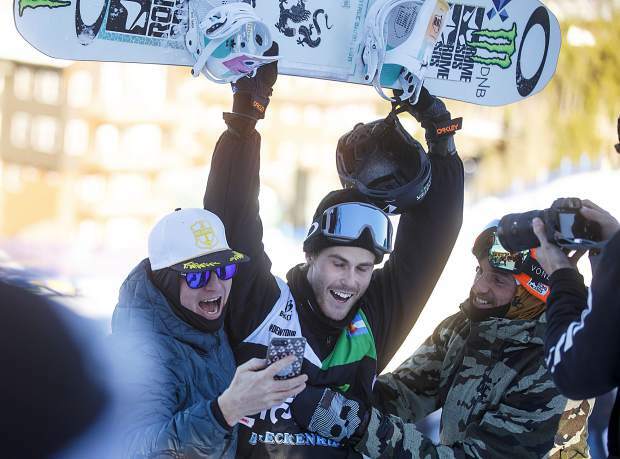 Stale Sandbech, of Norway, at right, reacts after winning Dew Tour's men's snowboard slopestyle competition on Sunday, Dec. 16, at Breckenridge Ski Resort. Stale Sandbech, of Norway, executes a trick during Dew Tour's snowboard slopestyle competition on Sunday, Dec. 16, at Breckenridge Ski Resort. 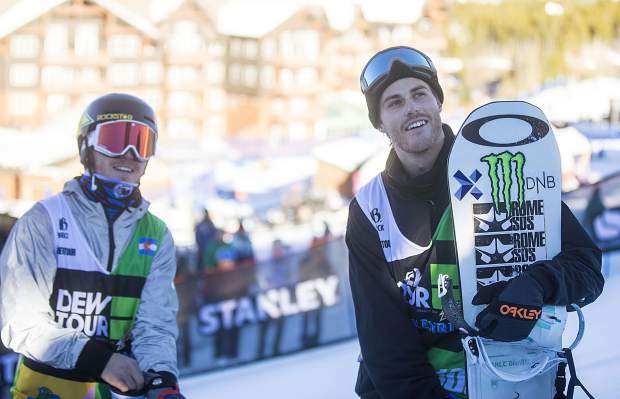 Stale Sandbech, of Norway, at right, reacts after finishing in first place at the Dew Tour snowboard slopestyle competition on Sunday, Dec. 16, at Breckenridge Ski Resort. Chris Corning, of Silverthorne, at left, placed second for the second consecutive year. 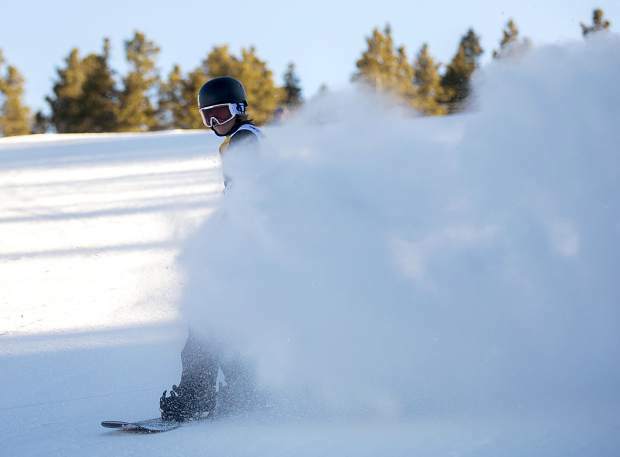 Summit County snowboarder Red Gerard comes to a stop following his final run at the Dew Tour snowboard slopestyle competition on Sunday, Dec. 16, at Breckenridge Ski Resort. Stale Sandbech, of Norway, at right, watches the results of Dew Tour's snowboard slopestyle competition with Chris Corning, of Silverthorne, at left, on Sunday, Dec. 16, at Breckenridge Ski Resort. Earlier this week, Chris Corning was so uneasy about preparing his run through the Dew Tour slopestyle course that he said he might even need a little luck to put on his best performance. He was nervous about the height and layout of the rails. He was unsure about the size of the jumps. 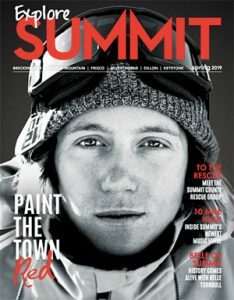 And he wasn’t anywhere close to figuring out exactly which tricks he’d do through the course’s jumps and jibs features. As is typical of the 19-year-old Corning, though, his penchant for practice and preparation paid off — big time. Namely, what enabled him to return to the Dew Tour podium after finishing in second place last year was the seemingly-endless days of football-like offseason weight room training he did in Centennial all summer. “Plain and simple, no,” Corning said of if he would have been able to do this same rail run this time last year. 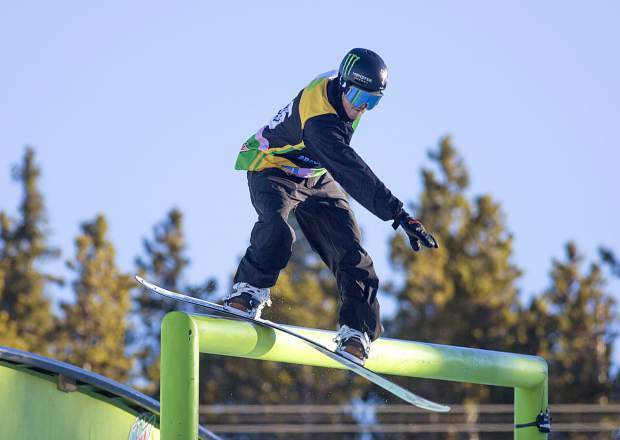 During Sunday’s grand finale of the Dew Tour at Breckenridge Ski Resort, Corning came back from outside of podium position halfway through the slopestyle competition to finish in second place. 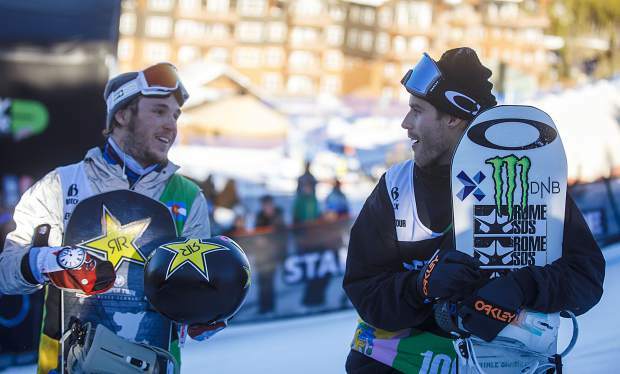 He came within 1.3 points of winning it all, behind champion Stale Sandbech of Norway (181.33). Sandbech only bested Corning on the Norwegian’s third and final rail run. On that rail run, Sandbech for the first time remembered to cue up his preferred music in his ear buds: the Harlem rapper A$AP Ferg. Sandbech then capped his rail run with a technical combination on two of the Mountain Dew rails. They included a 50-50 onto one rail before jumping over to the other feature for a nose slide and then finished with a back 270-off to a blind landing. Sandbech also threw in a celebratory dab dance move for good measure. Sandbech’s comeback into first place only followed Corning’s very own comeback into the top spot. Corning exited the first part of the slopestyle competition, the jumps portion, in fourth place, with a score of 89.00. To earn that score, Corning cleaned up his three-jump run of a switch back-side 1260, a back-side triple-cork 1440 (three inversions and four 360-degree horizontal rotations) and a flat-spin front-side 1440 with a double-grab, landing deep on each. Considering Corning is known for his mega tricks off of massive jumps, his fourth-place position off the podium put him in a very tough position entering the rails. As a result, he’d have to post a top score in the 90s to challenge for a victory. 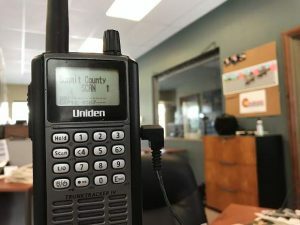 He did just that when he strung together a 91.00-point line through the rails that he only figured out the day prior, landing it just three times in practice on Saturday. That line come Sunday’s competition day included a switch board-slide to a 50-50 front-side 360 out of the Stanley rails feature. He then wowed the crowd even more when he executed a back-side 360 onto the next rail feature, with a front-side 180 off of it. The move required a lot of torque, as Corning said after the competition he wouldn’t have been able to even try it if not for his strength work this offseason. Corning made the most of that second chance on that near-flawless 91.00-point line through the rail section. He concluded it with a gap front-side 270 down on the penultimate rail feature. He then punctuated the line with an exclamation point of a trick: a 50-50 backside rodeo with a melon grab off the Mountain Dew rail. The inventive back and side-flip type move elicited an uproar from the assembled local Summit County crowd corralled down at the bottom of the course. Just moments later, Corning was rewarded with a jib section score of 91.00 that catapulted him up into first place with a total score of 180.00. Corning would hold onto that lead until Sandbech’s fateful final run through the course. Norwegian Mons Roisland rounded out the podium with a top jib-section score of 92.00 that improved his total score to 179.33. 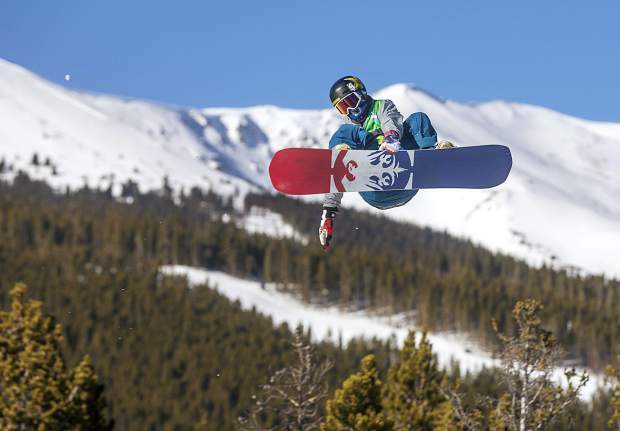 Summit County local rider and 2018 Olympic slopestyle gold medalist Red Gerard finished in 11th place with a score of 146.67. 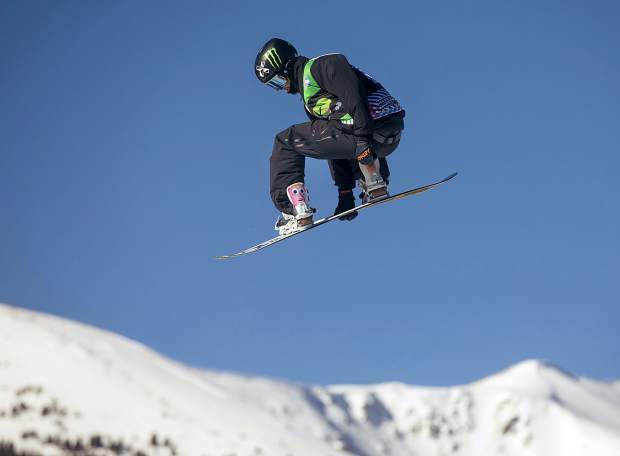 Michigan native and Silverthorne resident Kyle Mack, who won a silver medal in big air at the 2018 Olympics, was forced out of the competition after he slammed his shoulder into the snow on his second run through the jumps course.